Some 188,000 people have been evacuated from California towns downstream of the Oroville Dam; after fears of an imminent collapse of the dam's spillway prompted an evacuation order. The situation later appeared less dire. The threat of collapse at the Oroville Dam spillway is now over after water levels dropped overnight, according to the National Weather Service. There had been fears earlier Sunday that a collapse was imminent prompting the evacuation order. Almost 200,000 people were ordered to leave the area below America’s tallest dam, Lake Oroville Dam. The crisis has eased as water levels at the reservoir fell. However, officials say the situation remains dangerous and an evacuation order is still in effect. Butte County Sheriff's office said officials are working on a plan to enable citizens to return to their homes. “Immediate evacuation from the low levels of Oroville and areas downstream is ordered. This is NOT A Drill. This is NOT A Drill. This in NOT A Drill,” says the statement posted on the Butte County Sheriff’s Facebook page. Butte County Sheriff Kory Honea said the evacuation orders affect 188,000 people, AP reports. The dam’s spillway was “predicted to fail within the next hour,” the California Department of Water Resources (DWR) said at around 4:30pm PST Sunday (00:30 GMT Monday). “DO NOT TRAVEL NORTH TOWARD OROVILLE,” the Yuba County Office of Emergency Services said on Facebook, urging evacuees to travel safely in all other directions and help the elderly. Thousands of people from Yuba County and Sutter County have been filmed being evacuated from local towns and communities, with vehicles creating long traffic jams. DWR issued a statement, saying that there is no danger that the dam itself will collapse, as the incident had affected only an emergency spillway. “Oroville Dam itself is sound and is a separate structure from the auxiliary spillway,” the statement read. 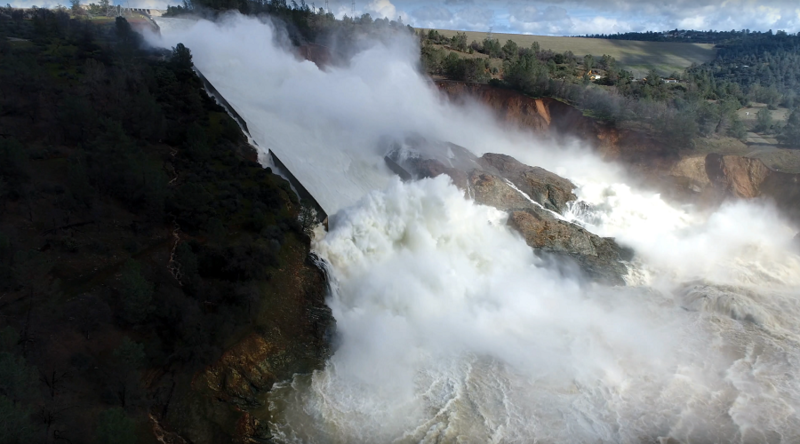 The emergency is the first time in the 48-year-old dam’s history that an uncontrolled spillway is being used, local NBC affiliate KCRA-TV reported. Heavy rains and snow that struck California this winter have resulted in the dam’s reservoir being filled up to the point of overspill. On Thursday, the works to release water from the dam began after chunks of concrete from the spillway were discovered in the channel below. On Friday, only 7 feet (2 meters) were left until the dam was to reach its full capacity. The DWR has been using the emergency spillway instead of the damaged one to release the water. Meanwhile, a series of statements from the DWR included a seemingly bizarre plan to fill in the widening gorge in the spillway by dropping rocks from helicopters. “Around 3pm we were advised of a hole that was developing near the lower edge of the alternative slash emergency spillway, which has been used to reduce the level of the lake given that the main spillway was damaged a couple days ago,” Sheriff Kory Honea told a press conference, adding that he was advised of the “imminent danger” that it would collapse. He added, however, that while the threat to the area remains significant, there is a chance to "avert the crisis" and efforts to do so are currently under way. “About 10 minutes ago, the DWR told me that the erosion that caused all this concern was not advancing as rapidly as they thought,” the sheriff said. Acting Water Resources director Bill Croyle also confirmed to reporters at around 10pm local time that the immediate danger had passed, with water no longer flowing over the eroded spillway. He cautioned, however, that the situation remained unpredictable. Officials are set to re-evaluate the evacuation orders at dawn, Reuters reported. Measuring 770 feet (230 meters) high, the Oroville dam is the tallest dam in the United States. It exceeds the Hoover Dam by more than 40 feet (12 meters).